When I first lived there in the early ’70s, the city was pretty dilapidated, decaying and declining (except for the attractive neighborhoods of large expensive homes in the city’s northern sections). I remember a lot of retirees, students, and like me and my wife, renters of small apartments in old buildings. The tiredness of the place was incongruous with its great location and weather. But then the first of several spectacular rises in real estate values took off. Rents started rising precipitously as well, and in a city where 80% of residents were renters, a political earthquake shook the establishment: in 1979 voters passed rent control and soon after that elected a slate of politicians backed by the SMRR – Santa Monicans for Renter Rights – to a majority on the city council. 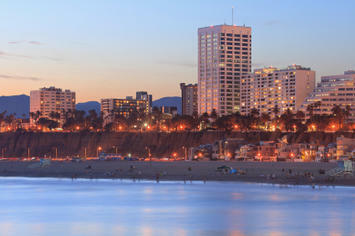 It has now been 30 years that the city of Santa Monica has been dominated by the politics and politicians of SMRR. What have they wrought? There have been some momentous battles. Property owners, denied the full use and fair value of their property, came to calling the place “the People’s Republic of Santa Monica.” As economists would predict, rent control resulted in the loss of rental units (and therefore the number of renters), slowed construction of new units, led to the deterioration of existing units as landlords deferred maintenance, decreased the city’s diversity, and increased its exclusivity. These were all opposite effects the original intentions of the new radical rulers. Other battles fought over the years have involved traffic issues, a living wage ordinance, preferential parking zones, McMansions, development and redevelopment, planning, zoning, schools, affordable housing requirements, and the height of fences and hedges – a thousand things big and small one would expect in a city of 85,000 residents and an annual budget of over $500 million. At some point in the 1980s, the SMRR-dominated City Council, once anti-development, realized that development could generate millions of dollars for city government necessary for funding its political agenda. Massive rezoning and redevelopment were approved. One might think that inconsistent policies often causing opposite effect of their intentions would have weakened the left. But two large factors have come into play over time. First, SMRR does not rule without consent and consensus – many, perhaps more than half, of home owners have supported the progressive politics and policies of the SMRR-controlled city council. Secondly, despite the concerns of some property owners and economists, Santa Monica has prospered. Despite powerful regulation, hotels, arts, jobs, and restaurants continue to flow into the city. Opponents on both sides concede most of the population is content and satisfied with the status quo. This has been accomplished with pragmatism and a willingness to change policies that were not working. The worst effects of rent control are in the past due to a state law that allowed vacancy decontrol. Same with homelessness: residents wanted to be "progressive" but realized that being kind to the homeless only increased their numbers. The city still overdoes it on permits, regulations, etc., but homeowners and business want to be “progressive,” so they go along with it (and they like regulation when it benefits their interests). The city decided to make itself a tourist destination, and it is, but when it looked like nothing but hotels would be built, voters passed a proposition to halt hotel development. On the other hand, last November voters defeated Prop T, which would have limited most commercial development in the city to 75,000 square feet a year for the next 15 years. Santa Monica Place, a huge indoor shopping mall, outlived its usefulness, so now it's being rebuilt as an outdoor mixed-use development. A living wage law was passed by the City Council, and then repealed by voters. So SMRR dominates political life in the city of Santa Monica, but it does so with the consent of many homeowners, property and business owners, as well as renters. Santa Monica is green, PC, insufferably "tolerant," self-satisfied, etc., but still doing well for itself. Taxes, rules, regulations and restrictions are onerous, but people and businesses still want to be there. I have lived through and observed the political battles of the last 30 years as a renter, homeowner and briefly as a landlord (never again, thanks). The transformation of Santa Monica reflects an interesting story: left-leaning activists who realize they can bend the establishment by controlling it from the inside. They then become the new establishment, but like in today’s left-leaning academia, work to make sure they themselves are never similarly deposed. And yes, I wonder if it holds lessons for the nation, with President Obama and the Democrats now in control and looking to implement a left-leaning agenda. What might those lessons be? One, particularly difficult for conservatives to accept, is that the time-tested machinations of leftist political machines sometimes work. They work for the powerful and the connected (who get to have their cake and eat it too: financial reward with a patina of progressivism), and they are perceived to work for the powerless and unconnected (however deleterious in reality). And that the left can come to power and rule with the consent of the governed, if it doesn’t “push the envelope” beyond a certain point, changes course when warranted, rewards cronies and allies, co-opts opponents where possible (and freezes them out where not). It worked for Tammany Hall, it has worked for Mayor Daley, and it seems to be working for Obama. Saul Alinsky would be proud of his protégé. Perhaps at the heart of its success is that like all successful political machines, SMRR “fixes potholes.” Frank Gruber, who writes a weekly column about life and politics in Santa Monica for The Lookout News, calls this “squeaky wheel government.” SMRR council members try to turn every complaining resident – and there are many – into happy SMRR voters. Whatever the aims of SMRR, they have created a popular government. In the 2008 elections, in which Santa Monicans voted overwhelmingly for Barack Obama, all four incumbents of the City Council won easily. SMRR seems as entrenched as always. In at least this paradisiacal portion of Southern California, left-wing government appears to be working – even if sometimes at odds with its own old radical objectives. Submitted by abcdef on Fri, 07/03/2009 - 21:07. As a frequent visitor to Santa Monica I would pretty much concur with Dr. Selbert's comments. The streets are clean, the parks are beautiful and well-maintained and a day in Santa Monica is invariably a pleasant experience. Yes, there is a large, visible homeless population and SMRR is not my cup of tea. But all in all, Santa Monica does a good job in the basics of city governance.